Priests who serve as college chaplains or campus ministers do not have an easy load to shoulder. These days, that role is likely just one of his many duties. “With the priest shortage, it’s difficult to have priests to be there on campus,” says Father Rick Nagel, pastor of St. John the Evangelist Parish and chaplain of Indiana University-Purdue University Indianapolis (IUPUI), both in the heart of the capital city. This reality is true for Father John Hollowell. In addition to serving as chaplain for DePauw University in Greencastle, he is also pastor of St. Paul the Apostle Parish in the same town and of Annunciation Parish in Brazil, as well as chaplain of Putnamville Correctional Facility. Dominican Father Patrick Hyde can also relate. He ministers as associate pastor of St. Paul Catholic Center in Bloomington, as well as head of the parish’s campus ministry serving the students of Indiana University (IU). But the three priests share one powerful source of help: Fellowship of Catholic University Students (FOCUS). And part of FOCUS’ help in ministering to college students is its biennial SEEK conference. With the support of the late Indianapolis Archbishop Emeritus Daniel M. Buechlein, he brought FOCUS and its lay missionaries to the IUPUI campus in 2009. The organization and its “multiplication of discipleship” concept now also serves at DePauw, and started serving at IU two years ago. 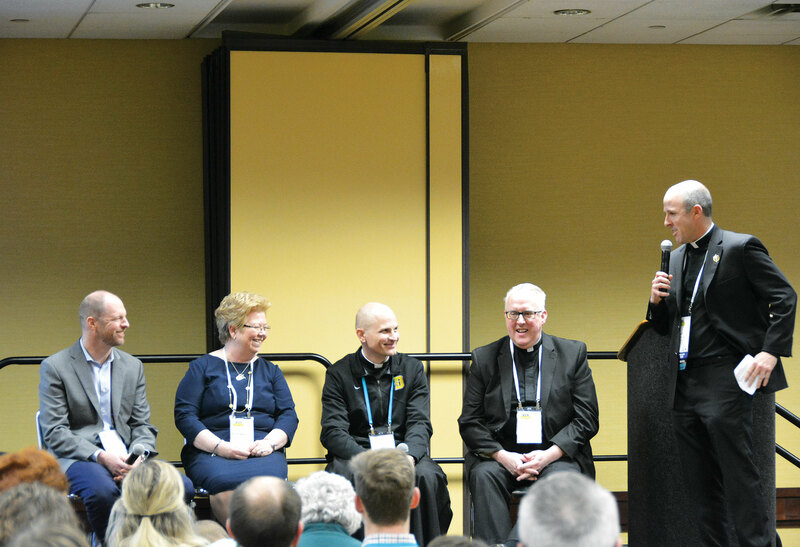 With its thousands of participants—more than 17,000 at SEEK2019 in Indianapolis on Jan. 3-7—students get “a sense of the universal Church not just with the other students, but also the hundreds of priests, religious and bishops,” says Father Nagel. This year, the bishops were primarily from other countries, as the bishops from the United States were on a retreat at Mundelein Seminary at the University of St. Mary of the Lake near Chicago. Witnessing the myriad religious men and women—many in traditional habits—is not the only impressive sight at a SEEK conference. 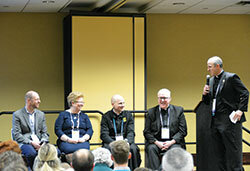 Father Nagel has attended four SEEK conferences before and witnessed its impact. “Sometimes there can be a ‘mountaintop’ experience with a retreat, but then they re-enter the world, and the effects wane over time,” he says. SEEK, which Father Hollowell says FOCUS “describes as an experience rather than a conference,” also serves as a way for chaplains and campus ministers to connect with their students. Father Hollowell, too, has taken advantage of the opportunity to attend the conference with the DePauw students he ministers to. 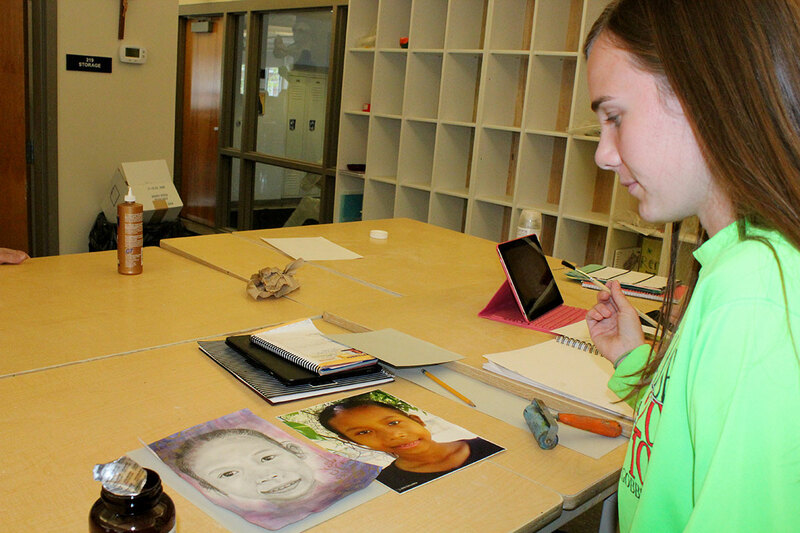 “I try to be with the students as much as I can here,” he says. “We’ve had lunch and dinner. I’ve gone to several talks with them. There are a lot of great questions and discussions. While Father Nagel notes that the majority of SEEK participants are university students, he says it reaches a broader audience as well. What’s more, FOCUS covers the cost of SEEK for priests who are college chaplains or ministers on campuses where FOCUS ministers, says Father Hollowell. In terms of more immediate impact, Father Patrick says he looks forward to witnessing SEEK’s effects on the students he ministers to.